Photo of Daw Khin Win. Widely shared. 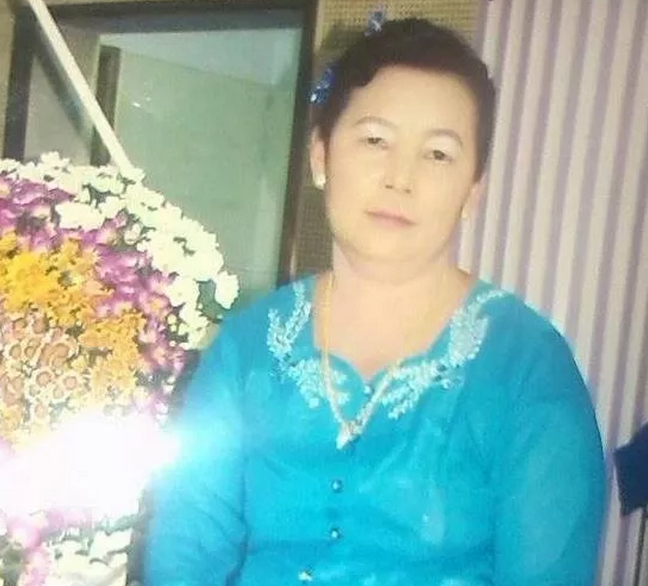 Daw Khin Win, a 56-year-old woman from Mogyopyin village in central Myanmar, was allegedly shot dead by police during a clash between 60 villagers and a Chinese mining company on December 22, 2014. Around 10 people and two police were injured during the confrontation. Violence spilled over into the next day with three more people receiving injuries. 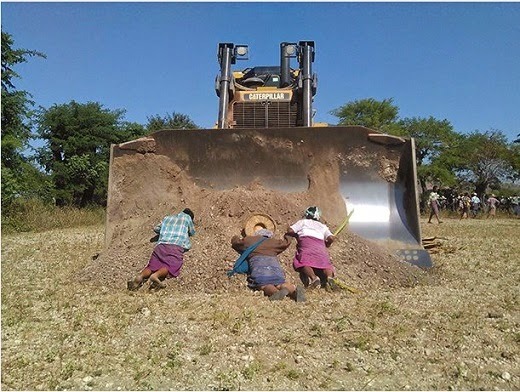 The incident grew out of a quarrel wherein villagers tried to obstruct the company's attempt to fence off an area of land close to the Latpadaung copper mine, taking on a company bulldozer in the process. The conflict intensified when Mogyopyin locals started using slingshots and police retaliated with force. The joint copper mining venture between the Chinese company Wanbao and the Union of Myanmar Economic Holdings (UMEH) is one of the most controversial investment projects in Myanmar. In November 2012, a protest against the mining company was violently dispersed with more than 60 people, including Buddhist monks, wounded. A state commission was formed to probe the incident, and as a result the company was ordered to pay financial compensation to local land owners, although many residents affected by the project viewed this measure as insufficient. It was these villagers — who refused to take compensation and surrender their lands — that were involved in the latest clash. The death of Daw Khin Win has angered many activists that have been supporting the villagers’ position since 2012. A female peasant was shot to dead [sic] in protest against land grabbing for Lapadaung mining project in upper Burma, near Monywa. More than 20 local peasants were wound [sic]. Ko Par Gyi was killed secretly but when his case was revealed [they] justified it by saying that he was shot for running away. Now let's wait how [they] will justify the death of the woman farmer from Latpadaung. People need to watch whether they will say that she was shot accidentally or if it was to protect the blind and helpless bulldozer [sarcasm implied]. Everyone needs to come together to try to achieve justice. If not we will have to live in fear that we might meet the same fate as Ko Par Gyi. I denounce the act of the government for violently dispersing the farmers from Latpadaung. The cause of these farmers is also the cause of everyone in the nation. We must help them. Do not be indifferent as if it is not our own. Next time it will be those who are indifferent [that suffer]. While we are aware of reports that some protestors threw stones at police, the resort to firearms raises very serious questions about how the police have handled this situation. The deadly clash between police and protesters in Mogyopyin will intensify public scrutiny of the Myanmar government, which seems unwilling to address growing dissatisfaction with a number of development projects underway across the country. brokering this Letpadaung copper mine deal. US$ 50,000,000.